In case if the account holder of Atal Pension Yojana(apy) scheme delays the payment, then there is a penalty for that. The penalty varies on the plan, you have opted. Although your bank account is connected with Atal Pension Yojana Scheme through Electronic Clearing Service (ECS), wherein every month, the payment is deducted automatically. In case, your bank account is not maintained with sufficient fund then the next time when you make a deposit to your account then late payment penalty charge is also levied. The delayed payment charges vary from minimum Rs.1 per month to Rs.10 per month. Rs.1 per month for contribution upto Rs.100 per month. Rs.2 per month for contribution upto Rs.101 to 500 per month. Rs.5 per month for contribution between Rs.501 to 1000 per month. Rs.10 per month for contribution beyond Rs.1001 per month. Note: The fixed amount of interest or penalty will remain as part of the pension corpus of the subscriber. In case of continued postponement in payment, the following actions will be taken by the bank. After a late payment of 6 months, the Atal Pension Yojana(APY) Scheme account will be frozen. After a 12 month of discontinuation of contribution, the Atal Pension Yojana(APY) Scheme account will be deactivated. After 24 months the Atal Pension Yojana(APY) Scheme account will be closed permanently. 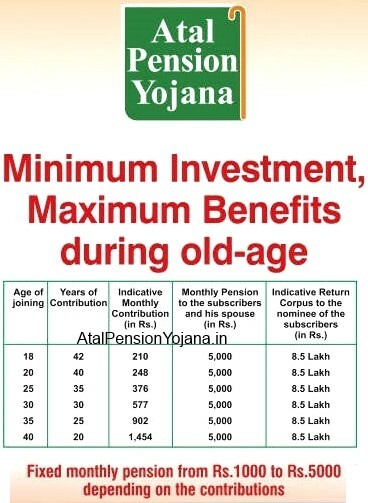 To get Atal Pension Yojana(APY) Scheme benefit, if a person submits false proof then the government contribution will be discontinued and taken back while the user will also be charged a penalty. kya ye schem main apne sister ke liye oprate kar sakti hu?? means mere pension meri bahan ko mile.?? Sir,kya rajay sarkar ki vardavastha pension bhi milti rahegi. I opted for APY in the month of September,2015. I have already submitted a written complaint in this regard. I hope canara bank takes necessary steps to resolve the issue at the earliest. I have applied for apy in SBI and it was activated on 27.06.2015 and my monthly contribution is Rs 330. From then my contribution is going on. But when I want the details of my deduction from the bank they says there is nothing to give and they have no circular about APY. Please help me at this matter.